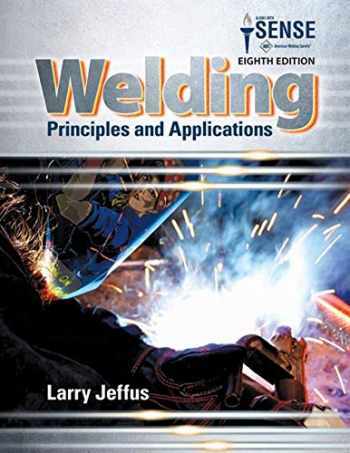 Acknowledged author Larry Jeffus wrote Welding: Principles and Applications comprising 976 pages back in 2016. Textbook and etextbook are published under ISBN 1305494695 and 9781305494695. Since then Welding: Principles and Applications textbook received total rating of 3.5 stars and was available to sell back to BooksRun online for the top buyback price of $59.82 or rent at the marketplace. This proven guide provides the knowledge and skills you need to complete AWS SENSE Level I and Level II programs, create Workmanship Qualification Specimens, and earn professional certification. Advancing rapidly from basic concepts and processes to today's most complex, cutting-edge welding technologies and practices, this comprehensive text features valuable information on topics such as welding metallurgy, metal fabrication, weld testing and inspection, joint design, job costing, and environmental and conservation tips. The author opens each section by introducing you to the materials, equipment, setup procedures, and critical safety information you need to execute a specific process successfully, while subsequent chapters focus on individual welding tasks leading to SENSE certification. Now with MindTap for Welding, complete with simulation and up-to-date welding videos.